This image of Io was taken by NASA's Galileo spacecraft during its ninth orbit around the planet Jupiter. It clearly shows one of the many active volcanoes on the small moon. This volcanic plume is estimated to be about 86 miles (140 km) high. The plume of material is erupting from a volcanic caldera known as Pillan Patera. The first evidence of volcanism on Io was discovered by the Voyager 1 spacecraft in 1979. 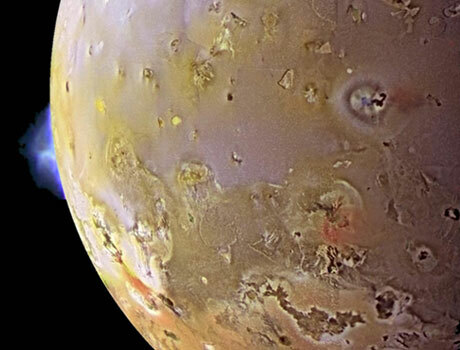 New observations have revealed that Io is the most volcanic object in the Solar System. Its surface is constantly reshaped by volcanic eruptions.